Discus fish are part of the largest group of vertebrates in the animal world: cichlids. 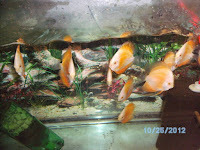 Cichlids are quite popular to amateur fish keeping hobbyists because of the huge varieties available. 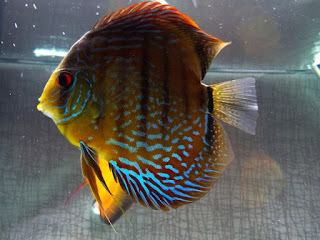 The discus is arguably the most eye-popping of the cichlid family, as you can see from the photos displayed here. Discus are found “naturally” only in one area of the world. That is in the Amazon River and its tributaries in South America. 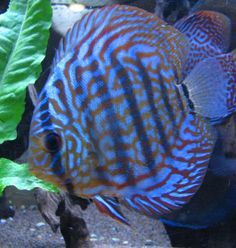 There are basically four ‘species’ of discus, all of which begin with the scientific name “Symphysodon…” These 4 species will be shown below with scientific designations. 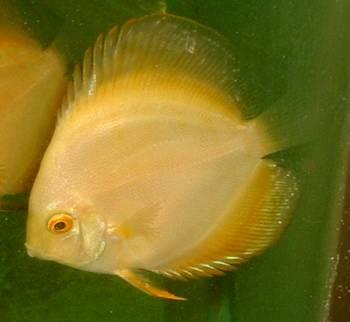 (There has been a recent move to name another species, that being Symphysodon tarzoo). 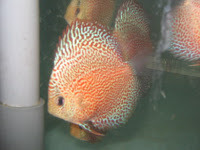 Because the demand for discus has increased wildly, there are now fish breeders who have been selectively breeding the discus to produce literally hundreds of strains of discus fish. Using natural mutations, they have produced variations in color, patterns, and shape. A few of these are displayed below the natural selections. 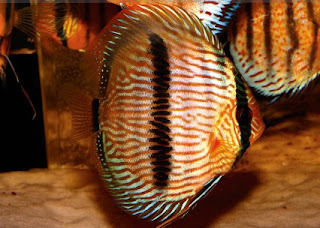 The distinguishing feature of the Heckel discus is the darker fifth stripe. There are two varieties – blue and red. The Heckel is the most difficult to keep in a personal tank because the water conditions are somewhat different than other discus types. The name, Heckel, comes from Johann Heckel. The Brown Discus is thought to be the easiest of discus varieties to keep (and breed) in a personal tank. 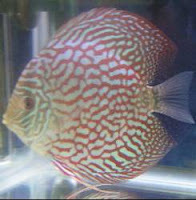 Prior to the popularity of man-made varieties, it was the most commonly kept discus. Body color can vary from a light brown to rusty, reddish brown. Body pattern includes vertical streaks on the body with more obvious streaks near the fins. Some folks confuse this variety with a brown discus because the colors are sometimes not as vibrant. However, there are fish in this category that are more colorful and hard to mistake for the brown discus. These bluer fish have defined blue stripes on their head and body, as well as on their fins. 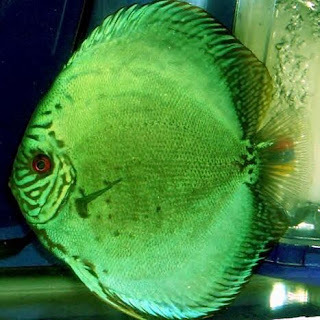 The Green Discus variety has a wide “variety” of colors. They can be solid green, yellow-green, olive green, or even brown (go figure). Many have green stripes on their body, while others have red body spots. Man-made species are exactly that. They have resulted from the intentional efforts of fish breeders to use the attractive features of natural discus and selectively inter-breed them, creating many varieties. 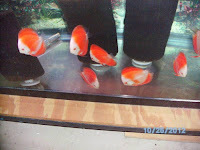 One of the positive aspects (aside from the beautiful colors and patterns) is that these un-natural fish are much more easily adapted to aquarium habitats. 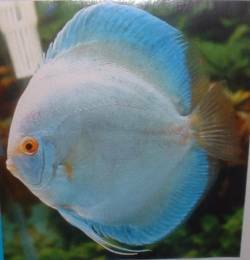 Below are a few of the more popular discus varieties available from breeders.